"Lydia Hernández...made her opposition to reproductive rights known in 2013 when she signed the Center for Arizona Policy’s statement denouncing Roe v. Wade." Former Az Democratic State Legislator Lydia Hernandez Says There’s No Voter Suppression! Know Your Anti-Choice Democratic Candidates In Arizona. Part 2. On Wednesday, April 31, 2014 the West Side Town Hall Steering Committee held a bipartisan candidate debate for legislative candidates in district 29 (a Phoenix LD). During the event Francisco Mendoza, a top financial donor and campaign manager for LD 29 State House Rep. Lydia Hernandez, asked "when it comes to preferences, and we have children here so I will not say the word, when it comes to those love preferences, do you prefer the same gender?" While questions of this sort are common among the Tea Party, they are out of place amongst Democrats. A person’s orientation should have no bearing in regards elected office. She did neither at that time nor since distance herself or her campaign from these comments and has not denounced them or her manager in any way. Stonewall has repeatedly attempted to contact Rep. Hernandez in regards this issue but with no results. 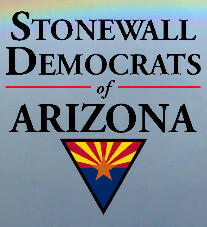 In consideration of these comments and others, the failure of Rep. Hernandez to denounce Mr. Mendoza and reject his comments, Stonewall Democrats of Arizona, as of today (May 3) denounce LD-29 State Representative Lydia Hernandez and support the candidacy of State Rep. Martin Quezada for State Senate LD-29.